Courier Mike Morrell on secret cycle routes, delivering bloody evidence and his favorite hangouts. Earlier this month, hundreds of bike couriers from four continents converged on Chicago for the 20th annual Cycle Messenger World Championships, a PBR-fueled gathering with competitions, arts events and parties celebrating the delivery lifestyle. The centerpiece was a checkpoint race held in the vast parking lot south of Soldier Field, simulating a day of Loop courier work. Seattle’s Craig Etheridge and Josephine Reitzel from Lausanne, Switzerland, were crowned the world’s fastest male and female messengers. Afterward, we picked the brain of the top-ranking local, Mike Morrell, a 12-year messenger veteran. 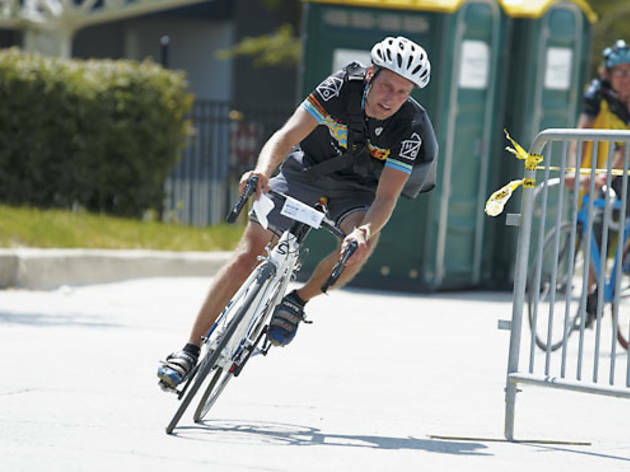 The 35-year-old cofounder of 4 Star Courier Collective finished in 17th place in a field of 258. As technology advances, is bike messenger becoming an irrelevant occupation? People will always want hard copies of things delivered. Yes, e-mail and whatnot has certainly cut into the industry. Maybe that’s why [carrier] racks are more [essential to messengers] these days: [to hold] larger files that can’t be so easily transmitted electronically. Food delivery [via bike] has gotten a lot bigger. And as cities become more congested, bikes will always have the niche of being able to slip into tight spots and get to places quicker than vehicles. Speaking of vehicles, messengers have near-misses with them every day. Do you have a stock insult to lob at bad drivers? Worst accident you’ve been in? I was going northbound past the turnaround in front of 401 North Michigan Avenue. I was giving a cab near me the evil eye, while still rolling forward. When I looked up there was a red light and an SUV was making a U-turn out of the turnaround. The only thing I could think to do was fall down. The SUV ran over my bike, but luckily not me. Entirely my fault. Any tips for avoiding Loop traffic—secret, superfast routes? Lower Wacker Drive. Bypass the busiest parts of the Loop and go six or seven blocks without hitting a stoplight. And it’s cooler down there, as long as you can put up with sewer smells. I also like a route that runs from the Sun-Times building down to 18th Street along some Amtrak tracks. It’s probably illegal, but it’s not marked as such, so you can always plead ignorance. Where do you blow off steam? On standby, the south side of the Merchandise Mart, which has a rotating array of nice furniture to sit on. After work, Cal’s Liquors. From a law firm to a courthouse, I delivered a prison mattress that was a piece of evidence. Somebody had been stabbed on it so there were bloodstains. But fortunately, it was wrapped in plastic.